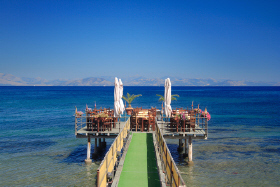 Greek holidays, and Corfu is no exception, revolve around the beach and Tavernas! Sadly, many associate Greek food with a bland soggy Mousaka, served with chips! It is true that during the 70's and 80's (Greece's early tourist years), this was the case. Fortunately, things have improved dramatically. Our food and wine guide will show you what to expect at a typical Greek Taverna and help you with what to order from the menu. How much will you need for eating out while on Corfu? Planning to visit Taverna Agni? Helping you choose where to stay. The Olive Branch Kitchen by Taverna -Agni- offers a professional catering/dinner party service with a chef and staff on hand or simply drop off our delicious Mediterranean food to you, so you can manage your meal when and how you wish.We use fresh, local or organic quality produce. During the Winter Months the Olive Branch Kitchen runs with dinner parties or any other events. Also join our cookery in our home, short courses can be arranged to suit your requirements.